I think it’s safe to say everyone has their favorite go-to pasta sauce. But, if by chance you don’t, well then friends, you’ve come to the right place! 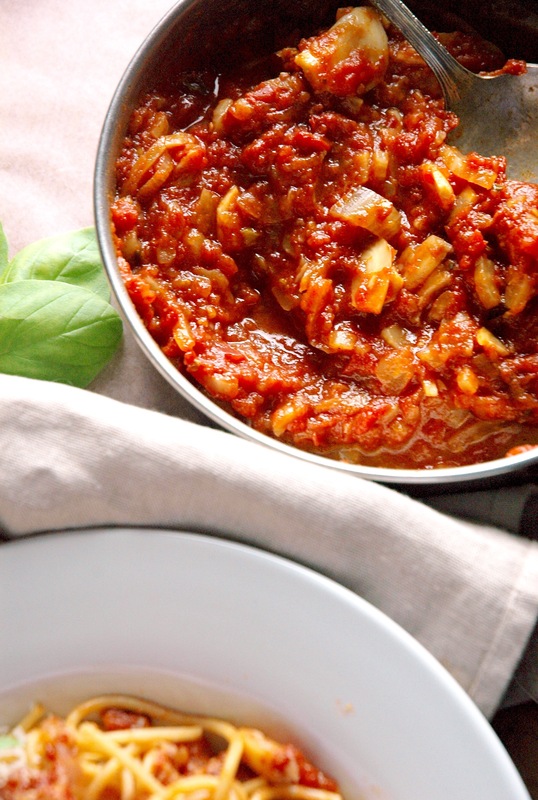 I seriously urge you to try this Smashed Tomato & Fennel Sauce. It is, quite simply, amazing and I make it all the time. All.The.Time. It’s not even an exaggeration. <— Ahem, attention, listen up: this is why you must try it! 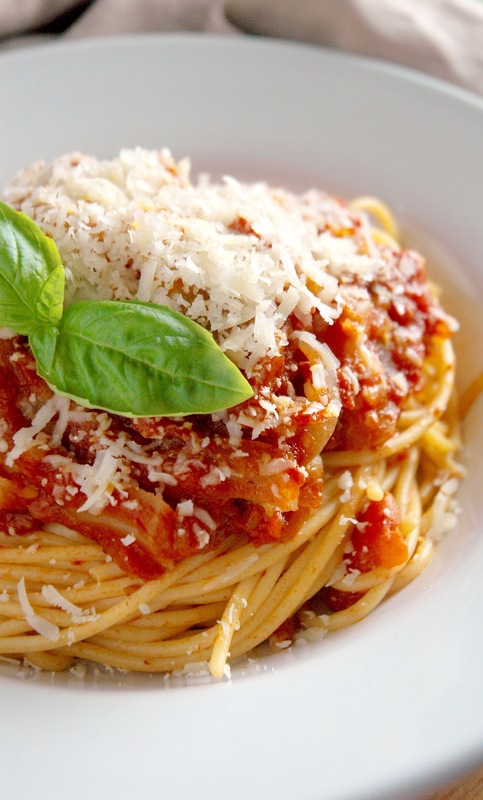 I think spaghetti and red sauce might be my #1 comfort food. In a previous post, I mentioned I was a red-sauce-pizza girl through and through. I don’t know what it is about red sauces but I never tire of them. Ever. Nick can attest to this because I never ever let him order that creamy potato pizza with béchamel sauce with an egg on it. (Okay Nick: we can get it next time, PROMISE.) They drizzle the sauce onto the pizza table-side, in case you’re wondering. It’s an experience. 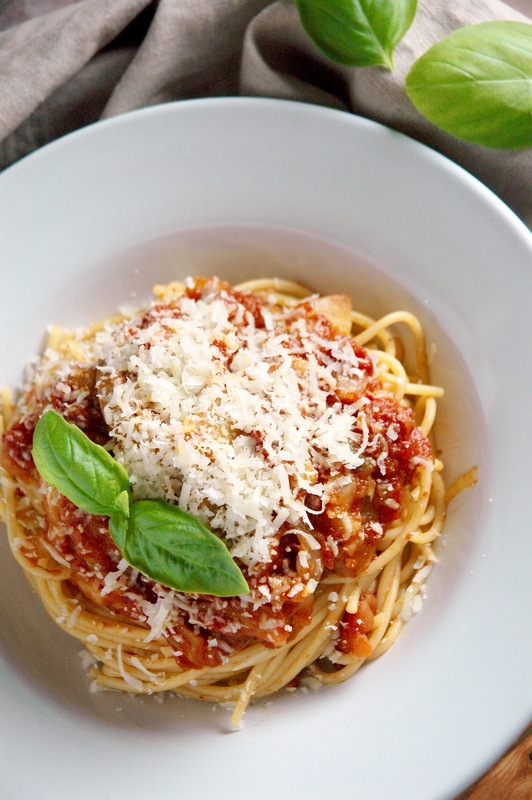 This sauce has become a staple in our home because it’s so simple, quick, and satisfying. It smells Amazing — yes, with a capital A — while it’s cooking and the flavor packs a serious punch. I’ve been making it on Friday nights lately, in lieu of going out to eat, because it’s really just that good. It feels sinful but hey! it’s ultimately healthier than what you would find at a restaurant these days. Smother your favorite pasta with it, pair it with a glass of your favorite red wine and you’re Good. To. Go. This sauce has a backstory. 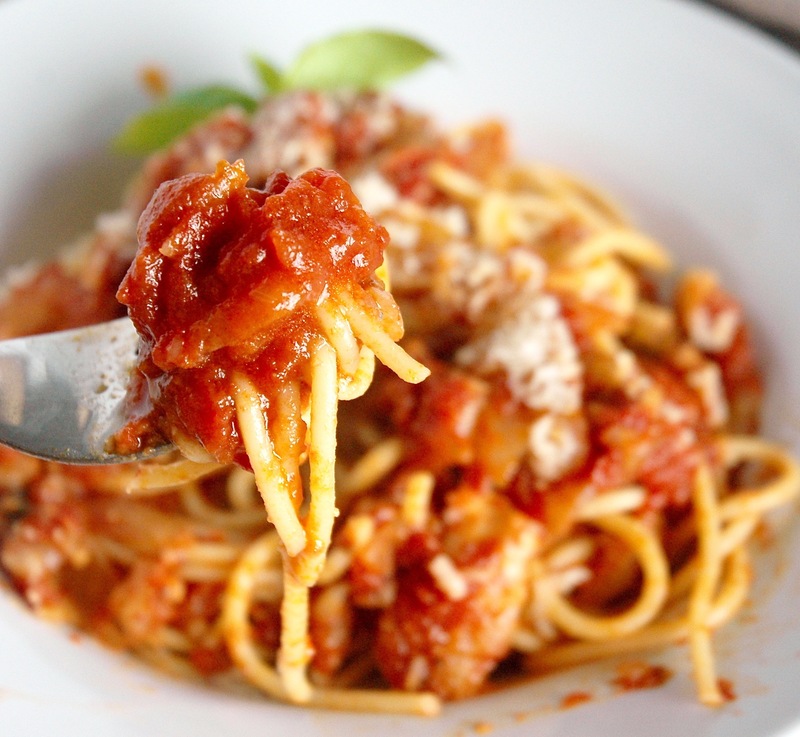 A while back I found an interesting tomato sauce recipe online featuring canned tomatoes slow-cooked in the oven…. in butter. Butter-poached, I think that was the phrase that described the method. Fancy schmancy. 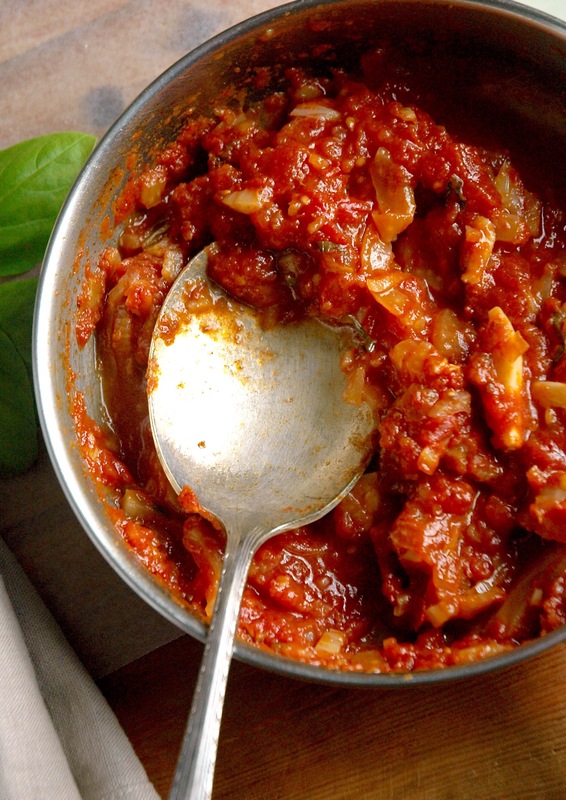 The purpose of this cooking method was to enhance or deepen the flavors of the tomato and get rid of the canned taste. Sure, it works. I used to make it all the time, and I’d throw in whatever veggies I had on hand to mix things up a bit. The sauce was amazing, but it always left me with a casserole dish stained in blackened tomato (AKA not the easiest to clean AKA sorry Nick forever because you had to deal with that). Eventually, we went back to more a traditional stovetop version. I kept the fennel though, that was my super special secret ingredient. I don’t know why it works so well, but it really does. Especially if you’re like me and you like your red sauces chunky. Meaning you can essentially eat them with a fork… if you run out of pasta. This is a judgement-free zone, friends. *If you don’t have fennel on hand, you can absolutely substitute for another veg. Sometimes I even go CRAZY and use spicy Italian sausage as the base of this sauce (EXTRA-YUM). I hope you guys enjoy this sauce as much as we do! It’s so much better than the store-bought kind, and not with too much extra effort! That’s a Win Win in my book. 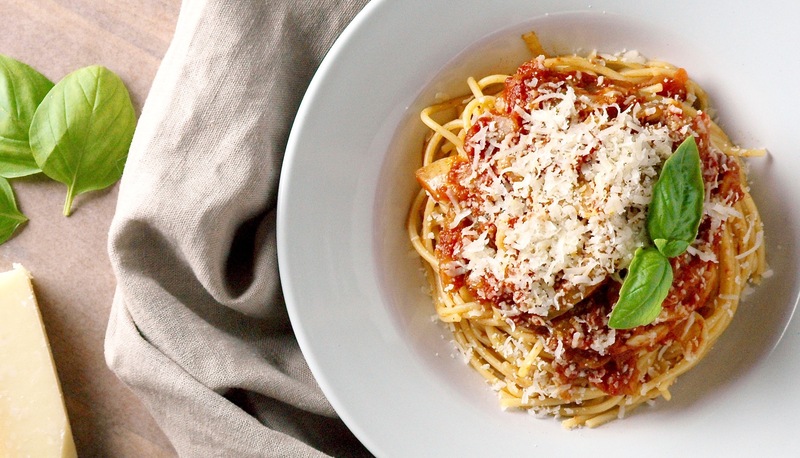 This is not your typical pasta sauce! Fennel gently braised in a simmering spicy red sauce that you can make any night of the week. Heat olive oil in a large skillet over medium heat. Once hot, add fennel and cook until softened and beginning to brown (about 5 minutes). Add garlic, oregano, red pepper flakes, salt and cook, stirring occasionally, until fragrant (about 2 minutes). Add tomatoes and a little bit of water (I fill the can a bit in order to grab the remaining tomato juices). Smash them with a potato masher, but be careful they may squirt! Bring the sauce to a boil, then turn down to medium low and simmer, partially covered until flavors have melded (about 15 mins). Season with additional salt and fresh cracked black pepper to taste. Serve with your favorite pasta and a healthy sprinkle of grated parm. I use my trusty potato masher to smash the tomatoes, which works really well. A wooden spoon or a whisk would work too. This sauce is even better the next day, and will keep in an airtight container for 1 week. It also freezes well! Can be used with pasta, as a marinara sauce, on pizza -- the possibilities are endless!